Soils are the natural materials on the land's surface that directly support plants and bacteria, and indirectly support all animal and human life. Soil builds up over time. Through gradual wearing and chemical decay, rock breaks down into smaller particles – gravels, sands, silts and clays. During this process nutrients are released, and become part of the soil. Many New Zealand soils are made from a build-up of fine, wind-blown sediments, volcanic ash or pumice. Soils store water and nutrients for plant growth, and absorb water that could otherwise cause erosion and floods. Soil microbes help release nutrients used by plants. Soils also store carbon, so less carbon dioxide is released into the air. New Zealand depends on soils for much of its wealth. Irrigation, drainage, and adding fertiliser has made its soils better for growing crops and pasture, and for grazing farm animals. Brown soils, which cover 43% of New Zealand. These form on mountains and hills, and down to moist lowlands. Pumice soils, found mainly in the central North Island. The pumice was ejected during past volcanic eruptions, including a huge eruption at Taupō, about 1,800 years ago. some ancient soils, which are more than 50,000 years old, and some very young soils, which have new sediments added every time there is a flood. a very small area of Anthropic (artificial) soils. These are created over landfills, or from other earth works. 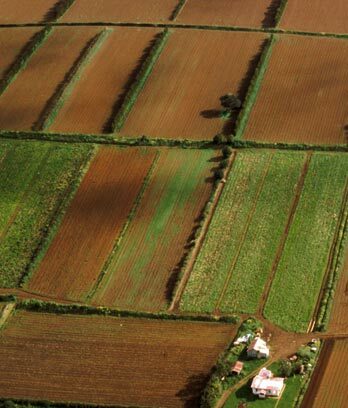 Types of soil vary and form patterns across a landscape.